A brighter smile can make a substantial impact where first impressions are concerned. A person with a radiant looking smile is often perceived as warm, healthy and full of vitality. So if you have an important interview, or you want to impress at an upcoming party or your just want to feel better about your smile, professional teeth whitening may be the answer that you’re looking for in St Albert. There are many ways to whiten your teeth, but the two most common are in-office or over-the-counter DIY products. While both yield results, they are not created equal. 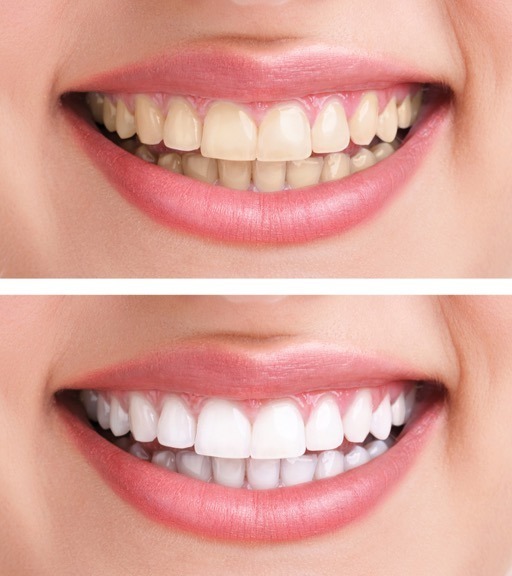 Professional teeth whitening services, like the ones we offer here at Dr. Riemer’s dental clinic, do not have the harmful side effects like do-it-yourself products, and are more efficient at restoring whiteness to your teeth. Quality results. It will be two to four weeks before you see any results with DIY whitening kits, and the results may not be what you were hoping for. In-office treatments use professional strength whiteners and custom whitening trays, which are much more effective than drug store products. Deep whitening. If you have darkly stained teeth, you need professional treatment that goes deeper into the enamel to whiten teeth. Dr. Riemer prefers the fabrication of customized bleaching trays to use with a professional whitening gel to use at home afterwards. This method is more cost-effective and produces less sensitivity than light and laser teeth whitening treatments. This treatment will give severely stained teeth the results you simply can’t get with at-home whitening kits. Whitening designed specifically for you. Drugstore whitening products have a “one size fits all” approach to the levels of active ingredients used in their products. You may need more or less depending on the degree of whiteness you want, and what your teeth are naturally able to achieve. Your dentist knows exactly how much product is ideal for your particular teeth. Safer application. If you have cavities, cracks or other issues with your teeth, gums or mouth that you’re unaware of, applying whitening product could cause you serious pain and discomfort. Your dentist will first ensure that your teeth and gums are healthy enough to receive whitening treatments. Then they will make sure treatment is applied correctly to avoid contact with your gums, cheeks, and tongue. Are you looking for dentists in St. Albert? Teeth whitening is the most commonly requested cosmetic dental procedure offered at Dr. Riemer’s clinic. We have the expert knowledge, skills, and equipment to correctly whiten your teeth and ensure you have a pleasant, pain-free experience – and a drop dead gorgeous smile too! To see if you’re a good candidate for professional teeth whitening, book your consultation today.